Is it a mystery to you what your grandmother’s kitchen might have looked like? Some of us are lucky enough to be able to still visit that ancestral home but many are not so lucky. This is supposed to be a typical 1928 kitchen….. note the icebox, woodstove, two faucets for water (at least there was running water!) and the stool by the sink. And I read that pink and light green were “the” colors of choice. Your public library has back issues of many womens’ magazines of the period. You can request them via your library and then page through all the “funny pictures.” How about Better Homes & Gardens of the 1930s? Good Housekeeping published from 1910? Sunset magazine which has been around since 1898? 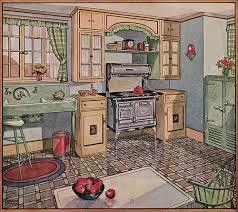 Is yours today a retro kitchen? Do you have an icebox??????? 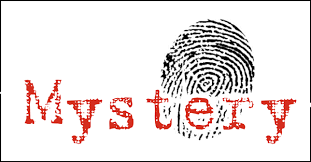 This entry was posted in Monday's Mystery. My son has my Paternal Grandparent’s icebox> I can remember them getting large blocks of ice delivered. Later, when the got an electric frig – it became Grandmother’s can good storage!! I remember – before they got inside running water, Grandmother had a pump at the sink, all water was heated on the kitchen wood stove. Between Grandmother Davis and that stove — I had a wonderful childhood, home made noodles, biscuits and gravy, fried or roasted chicken, pear butter and fresh from the cow milk!!! Pretty awesome memories!!! haha good article. We live in a 1928 apartment building in Capitol Hill Seattle. We do have an icebox!! It is now a cupboard, but the metal door is still on it. We also have light green and white ceramic tile on the counters. AND an Ironing Board in the wall in its own cupboard! My grandmother’s Willow Lake, South Dakota kitchen had a pump at the kitchen sink; a cradle hanging from the ceiling, a box of kittens behind the wood stove, and a reservoir on the side of the stove for hot water. The large, round rock cistern was in the porch entry and covered by wooden planks, the drinking dipper hung by a string on the side. Next to that was the milk separator; I loved to turn the handle and listen to the whine of the gears. Grandpa’s wash basin sat on a small table with the bar of homemade lye soap in a little dish. His can of snuff sat there too, and I was admonished to never touch it. Of course, I did take a pinch and swallowed it so I wouldn’t be found out. But my green 8 yr old face told grandpa all he needed to know about where his “snuss” went! We almost bought a “modern” house in Dodge, North Dakota in the early 1990s. It was “modern” because it had a pump in the kitchen for water, a cold room in the cellar and indoor plumbing! Dodge had a population of 128 people at the time.